Blame the system, not the people. A lot of people worked incredibly hard towards something positive. There were some screwups (late injection of the Danish text? ), but on the whole, things didn’t come together because the structure wasn’t in place for them to do so. The US came to the table with nothing to offer – a tentative commitment, but no money and no headroom for bigger commitments. There’s little trust between parties. The developed world needs to demonstrate something concrete (significant emissions cuts or big $) before the developing world will budge. You can’t fix historic emissions inequity with future emissions – unless you don’t care about anything remotely like a 2C target. It’s not just about climate – development, resource management, and many other problems are intertwined. When major unstated values or mental models are in conflict, the COP process reverts to niggling over unimportant administrative details. It’s a good idea not to register more participants than you can handle. Analysis and decision support are probably not the key constraint at this time (maybe later). Negotiators need more scope from their home constituencies to be able to reach agreement. Emissions and welfare are not the same thing. Deep cuts for the world imply ~100% cuts (or more) in the developed world. It’s tough to reach 100% cuts due to fixed process emissions and activities for which it is difficult to substitute for hydrocarbon fuels. A number of industries are planning on more than their share of the remaining x% of emissions – how will it really add up? During C-ROADS development, we explored several ways of accounting for cumulative per capita emissions. One practice that seems to be widespread is to accumulate (integrate) emissions divided by population, i.e. This is physically meaningless. 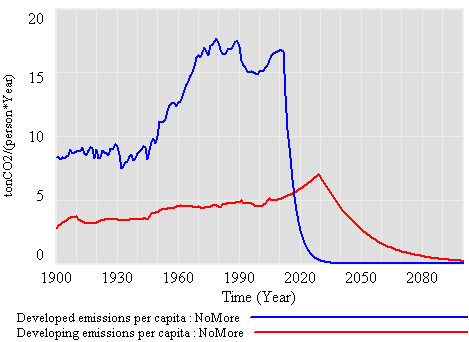 Emissions per capita is an intensive variable, and you can’t average or accumulate intensive variables in this way. It’s like averaging the temperature of a duck and a supertanker without accounting for the tankers 100,000x greater mass. 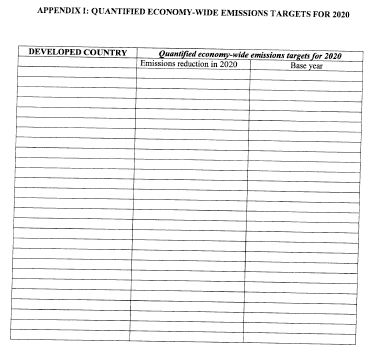 That yields a physically meaningful number, interpreted as cumulative emissions of a nation per current inhabitant. That’s a bit like per capita national debt. What about the price of carbon? In that case, price of carbon would be very high in the developed world, and very low in the developing world. That creates intense pressure for leakage. 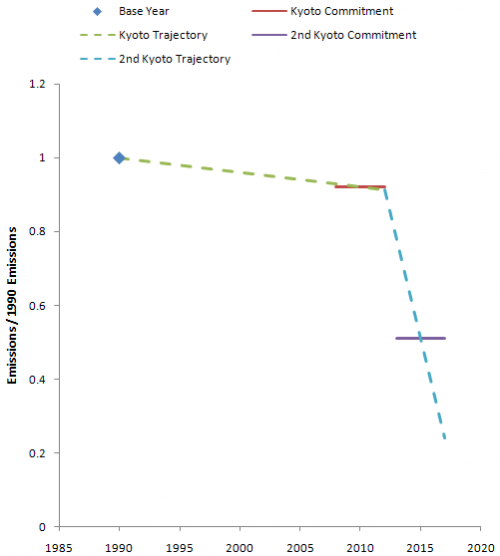 Emissions-intensive industries would simply relocate to developing countries. Total emissions wouldn’t necessarily go down, except to the extent that relocated capital was newer and cleaner, and might even go up due to greater transport distance and less stringent environmental regulation. Another consequence is that investors in the developing world, including governments investing in infrastructure, would proceed to build GHG-intensive capital that would just have to be unbuilt in a decade or two. That’s not development; it’s unsustainable lock-in to a dead-end economic, technical, and lifestyle trajectory. Probably the first thing to happen would be for workers (aka voters) in the developed world to freak out at the resulting job losses, causing the whole agreement to unravel. So, I think you can scratch this kind of arrangement off the list of possible or attractive agreements. If we want to achieve the underlying development goals that motivate people to ask for such things, we need to find a different path. Author TomPosted on December 17, 2009 Categories Climate, COP15, PolicyLeave a comment on What about the price of carbon?